Image caption 'S e am Morair Minginis a bhios air an Siorram Ruaraidh Iain MacLeòid. 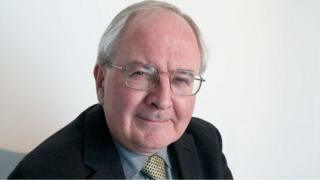 Chaidh an Siorram Ruaraidh Iain MacLeòid QC a stèidheachadh mar Chathraiche ùr Chùirt an Fhearainn, leis an tiotal ùr, am Morair Minginis, air an 17mh Dàmhair. 'S e Mgr MacLeòid a' chiad chathraiche le Gàidhlig bhon chaidh a' Chùirt a stèidheachadh ann an 1912. Rugadh is thogadh e ann am Port nan Long, ann an Sgìre Mhinginis den Eilean Sgitheanach, ach b' ann às na Hearadh a bha a phàrantan bho thùs. Ghluais iad dhan Eilean Sgitheanach anns na 1920an, mar phàirt de Sgeama Rèiteachaidh an Fhearainn a bha a' gabhail àite aig an àm. An dèidh an sgoil fhàgail, thug Ruairidh Iain a-mach ceum ann an Lagh aig Oilthigh Dhùn Èideann agus anns a' bhliadhna 2000 chaidh a stèidheachadh mar Shiorram, mus tug e air an dreuchd mar Iar-Chathraiche Chùirt an Fhearainn ann an 2006. A bharrachd air a bhith an sàs anns an lagh, tha Ruaraidh Iain air a bhith a' cur taic ri Sabhal Mòr Ostaig OGE. Ann an 2006, ghabh e àite air Bòrd an t-Sabhail agus bliadhna às dèidh sin, ghabh e thairis bhon Ollamh Fearchar Mac an Tòisich mar Chathraiche a' Bhùird. Thuirt Prionnsapal Sabhal Mòr Ostaig, am Proifeasair Boyd Robasdan: "Tha sinne aig Sabhal Mòr Ostaig air leth toilichte gun deach an Siorram Ruaraidh Iain MacLeòid ainmeachadh mar Chathraiche ùr Cùirt an Fhearainn agus gun deach inbhe Morair a bhuileachadh air. "Tha sinn a' cur meal-a-naidheachd air Morair Mhinginis agus a' guidhe gach soirbheachadh dha na dhreuchd ùir. "Tha am Morair Minginis air a bhith na Chathraiche air Bòrd an t-Sabhail bho 2007 is tha sinn fìor mhothachail air na comasan, sgilean agus feartan a tha aige, agus tha sinn cinnteach gum bi iad sin air an cur gu deagh fheum na dhleastanasan mar Chathraiche air a' Chùirt."